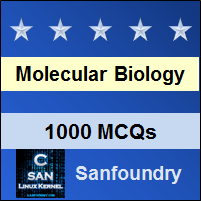 This set of Molecular Biology Multiple Choice Questions & Answers (MCQs) focuses on “Three Possible Reading Frames Exist”. 1. For the translation to be initiated which of the following does not occur? Explanation: For translation to be successfully initiated, three events must occur. First, the ribosome must be recruited to the mRNA. Second, a charged tRNA must be placed into the P site of the ribosome. Third, the ribosome must be precisely positioned over the start codon (AUG or GUG). 2. Changing in the positioning of the ribosome leads to the synthesis of different proteins. Explanation: The correct positioning of the ribosome over the start codon is critical, because this establishes the reading frame for the translation of the mRNA. Even a one-base shift in the location of the ribosome would result in the synthesis of a completely unrelated polypeptide. 3. What kind of interactions results in the binding of mRNA and the ribosome? Explanation: The assembly of the ribosome on an mRNA occurs one subunit at a time. First, the small subunit associates with the mRNA. For prokaryotes the association of the small subunit with the mRNA is mediated by base pairing interactions, that is hydrogen bonding, between the ribosome binding site and the 16S rRNA. Explanation: Typically charged tRNAs enter the ribosome in the A site and only reach the P site after a round of peptide bond synthesis. During initiation, however, a charged tRNA enters the P site directly. 5. The initiation of translation requires a special type of tRNA to bind to the ORF of the mRNA. Explanation: When the polypeptide chain is elongated the aminoacyl tRNA enters the A site. In case of initiating the synthesis of polypeptide it can only be done by the initiator tRNA which contains the anticodon for the start codon on the mRNA. Explanation: The start codons being either AUG or GUG codes for methionine or valine respectively, but neither of them is attached to the initiator tRNA. Instead, it is charged with a modified form of methionine, N-formyl methionine that has a formyl group attached to its amino group. 7. Deformylase has a crucial role to play in the formation of mature polypeptide chains in prokaryotes. Explanation: In case of prokaryotes the initiator amino acid is N-formyl methionine. This formyl group is removed from the polypeptide as we know that no polypeptide starts with a formyl group. This is done by the enzyme deformylase. 8. How many translation initiation factors work hand in hand to initiate prokaryotic translation? Explanation: The initiation of prokaryotic translation commences with the small subunit and is catalyzed by the three initiation factor. They are of three types IF1, IF2 and IF3. 9. Which of the following is a GTPase? Explanation: GTPase is a protein that binds and hydrolyses GTP. IF2 is a GTPase that binds to the three key components of translation, the small subunit, the charged initiator tRNA and the IF1 and facilitates their subsequent association. 10. Which of the following is not the function of IF3? Explanation: IF3 binds to the small subunit and blocks it from reassociating with the large subunit. It also blocks the binding of small subunit to the charged tRNAs as it is critical for the small subunit to be free for initiating translation and binding with the correct initiator tRNA. 11. When the large and small subunit of ribosome associate which of the following is not found within the complex? Explanation: When the start codon and fMet-tRNAifMet base-pair, the small subunit undergoes a change in conformation. This altered conformation results in the release of IF3. In the absence of IF3, the large subunit is free to bind to the small subunit with its cargo of IF1, IF2, mRNA and fMet-tRNAifMet. 12. Binding of the large subunit to the small subunit triggers a cascade of reactions. Arrange them in the order of their occurrence. Explanation: The binding of the large subunit stimulates the GTPase activity of IF2-GTP, causing it to hydrolyze GTP. The resulting IF2-GDP has reduced affinity for the ribosome and the initiator tRNA leading to the release of IF2-GDP as well as IF1 from the ribosome. Thus, the net result of initiation is the formation of an intact (70S) ribosome assembled at the start site of the mRNA with fMet-tRNAifMet in the P site and an empty A site.